The Elk Mountain Grand Traverse: Not the Alps. Not Trail Running, Either. A rowdy midnight start amid 400 glowing headlamps. Dozens of miles of wintry, Colorado backcountry. Wildly enthusiastic volunteers placed strategically at high passes and deep in the forest. Reclining with beers in lawn chairs at the sunny Aspen finish. The Elk Mountain Grand Traverse has got to be, hands down, one of the most remarkable endurance events in the country. But, why would Run the Alps feature a story about a 40-mile long backcountry ski mountaineering race through the heart of Colorado’s Rocky Mountains? Good question—and one with more than a few answers. So many interests and values are shared by Run the Alps’ friends, the 400 participants, and the nearly 100 volunteers in the Grand Traverse that, well, it just makes sense. Then, there’s the crossover between ski mountaineering racing and trail running. In Europe, it’s a given. Kilian Jornet and Emelie Forsberg, International Skyrunning Champions, have held comparable “Ski Mo” titles. Here in the US, there’s a growing connection between the activities, which complement each other beautifully. This year’s GT featured a number of top trail runners on or near the podium, including multiple GT winner Stevie Kremer, who won the women’s division with her partner Jari Kirkland. Kremer’s husband J. Marshall Thomson, holds the course record for the nearby Collegiate Peaks 50. Racing with none other than Rob Krar, one of the strongest ultrarunners in the country, Thomson and Krar came in a strong second to the duo of Paul Hamilton (who took second place in last year’s Speedgoat 50 km) and partner Scott Simmons, a member of the U.S. Ski Mountaineering team. Simmons and Hamilton recorded a time of 6:44– which, to those of us recreational racers fresh off the course– feels downright superhuman. As for the event, like a great trail race, it had everything a participant could want. A surreal midnight start, miles of cruising through wilderness, a sunrise that revealed some of the west’s most stunning mountain vistas and, through it all, plenty of hard work moving quickly through forests and over high alpine terrain. Not many races can match the exuberance of the GT’s volunteers, either. Throughout the Elk Mountains, they staffed checkpoints, handed out water, and monitored teams to assure that everyone was moving safely towards the Aspen finish line. Prior to the race, snow safety teams assured the security of avalanche-prone slopes. During the race, they marked the alpine sections with bright strobes, which gave participants the feeling of a slow-motion, high-altitude airport landing. Like a great trail race, too, the GT is an inclusive event. As morning turned to midday and mid-day turned to afternoon, all finishing teams were greeted with overflowing enthusiasm at the base of Aspen’s Ajax mountain. I usually find myself dismissing the more-than-a-bit-worn expression, “We’re all winners.” But, hearing the cheers as my race partner and I skied through the finish line, it wasn’t hard to feel like we were being welcomed as minor conquerors in our own right. That’s a rare feeling for a non-elite racer, and one usually reserved for European trail races, in my experience. It’s great to have that outpouring of support here in the U.S, too! An event like the Grand Traverse cannot come together without the committed effort of a large number of enthusiastic volunteers. Heartfelt thanks to all, for being an integral part of a unique event. Look around at well-executed races with a great vibe and you’ll also find excellent leadership, too. A year ago, I reached out to the Grand Traverse to explore a partnership with Run the Alps. A response both eager and thoughtful came from Director of Events Andrew Arell. A year later, and having seen Andrew in action, it’s clear that his steady, organized leadership will be a key part of the GT’s success in the years to come. 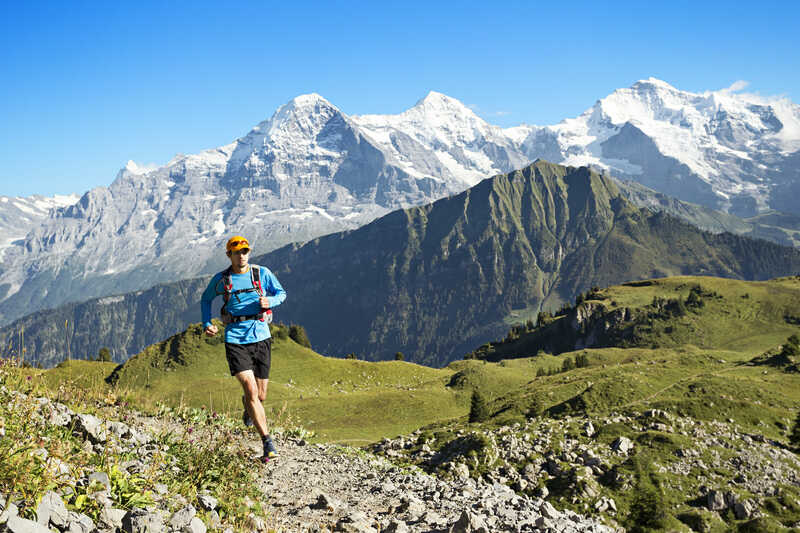 Run the Alps and the Grand Traverse are exploring partnership ideas and will, I suspect, join efforts on a project or two in the years to come. In the mean time, I’ll have fond memories of this year’s GT, and look forward to future late-night forays through the Elk Mountains. A final thought about the GT: the event is a fundraiser for the local, non-profit Crested Butte Nordic Association. In an era of high-priced events where proceeds benefit marketers, it’s nice to write a check whose proceeds will directly improve the quality of life and fitness of one town’s citizens. More information on the Grand Traverse is available here. P.S. There’s one last reason to write about the Grand Traverse here on Run the Alps: There’s a trail race, too! New as of last year, the summer GT follows much the same course as its older, better-known winter sibling. So, should you find yourself trail running in Colorado next Labor Day weekend, consider adding the summer GT to your “to-do” trail running list.